Durban, South Africa – A partisan crowd packed out the Durban ICC Arena in anticipation of an action packed evening of fights at EFC 43. 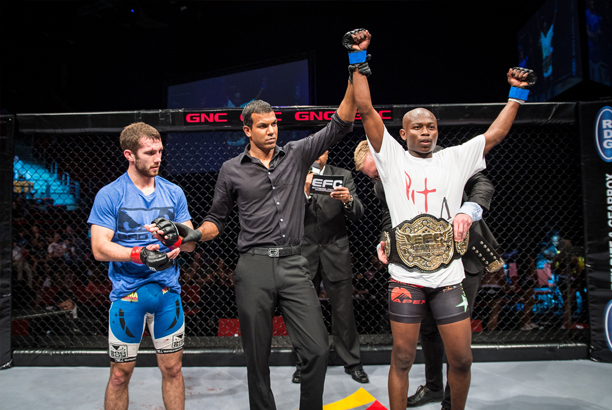 The flyweight championship fight between Nkazimulo ‘Zulu Boy’ Zulu and Craig ‘Nemo’ Ninow headlined the event. Backed by a boisterous crowd chanting his name, ‘Nemo’ entered the Hexagon looking to make good on his destiny. It was not to be though, as history repeated itself in a rematch between the two. Zulu put on a clinical performance with a well thought strategy. He took Ninow down early which made the local wary of further takedowns and kept his distance. This lead to Ninow’s eventual downfall as he was caught with a devastating uppercut. As soon as Ninow dropped, Zulu pounced on his opponent, landing vicious ground and pound shots that forced the referee to award the victory via TKO. For the first time in EFC history, the women’s division was represented on the main card. Featuring South Africa’s Amanda ‘Mad Dog’ Lino and France’s Isabelle ‘Mademoiselle’ Pare, the ladies showed no hesitation by engaging from the first bell. Pare took advantage of Lino’s wild swings by showing her boxing pedigree and flooring the South African. Once stunned, Pare proceeded to display her ground skills and sink in a Rear-Naked Choke to win on her EFC debut in round one. In a bout to decide the EFC middleweight number one contender, Poland’s Rafal ‘The Polish Tank’ Haratyk faced formidable submission expert Warren Allison. What started off as a slow encounter with neither man wanting to make a mistake, Haratyk was the first to find his distance and land a powerful overhand right to stun the South African. Allison showed grit and fought back, but it was not enough, as he got caught in a vicious standing guillotine choke. Haratyk will now face the newly crowned champion Liam Cleland at date to be decided. Durban featherweights Wesley ‘Young Assassin’ Hawkey and Sizwe Mnikathi came out to put on a show for the local crowd. It was the incredibly tenacious Mnikathi that remained cool, calm and collected by sticking to his game plan to get in close and impose his will. Once on top, Mnikathi was relentless with punches and elbows to the temple of Hawkey who eventually gave up his back, leaving his neck exposed to a Rear-Naked Choke and giving Mnikathi a win over a big name on the featherweight roster. Tyson Chelin squared-off against Johannesburg’s Tumisang ‘The President’ Madiba in the first bout on the main card. Both men were in desperate need to get back into the win column, but it was the visiting Madiba that pulled off the upset over the Durban local. Fight of the night bonuses were awarded to Nelson Feiteira and Pierre Botha for their three round war. Performance bonuses were awarded to Tumisang Madiba and Sizwe Mnikathi, plus additional performance bonuses were awarded to Andrew Smith, Pieter de Klerk, Martin de Beer and Baldwin Mdlalose for their sublime performances. Mario Ferreira defeated Teryl Singh via TKO 1:59 in round 1. Andrew Smith defeated Pieter de Klerk via unanimous decision. Georgi Georgiev defeated Didier Nyembwe via doctor’s stoppage at the end of round 2. Martin de Beer defeated Tshilomba Mulumba via TKO 4:25 in round 1. Keron Davies defeated Quaid Openshaw via Rear-Naked choke 3:43 in round 1. Pierre Botha defeated Nelson Feiteira via split decision. Baldwin Mdlalose defeated JP Buys via Rear-Naked choke 3:29 in round 1. Tumisang Madiba defeated Tyson Chelin via Rear-Naked choke 4:07 in round 1. Sizwe Mnikathi defeated Wesley Hawkey via Rear-Naked choke 4:56 in round 1. Rafal Haratyk defeated Warren Allison via guillotine 4:50 in round 1. Isabelle Pare defeated Amanda Lino via Rear Naked choke 1:02 in round 1. Nkazimulo Zulu defeated Craig Ninow via TKO 2:16 in round 1. EFC 44: Van Zyl vs. Asker, Mynhardt vs. Gorimbo, Allen vs. Henry, presented by BetXchange.com, and takes place at Carnival City, Johannesburg, on Saturday 03 October 2015. Tickets available at www.computicket.com.